FIGURE4 ■ Ex vivo kidney perfusion model to study the impact of renal perfusion and various pressures during Hydro-Jet application. FIGURE 5 ■ Ex vivo demonstration of the effect of Hydro-Jet on renal parenchyma. Note tissue selectivity with separation of renal parenchyma and preservation of a net of vasculature and collecting system. 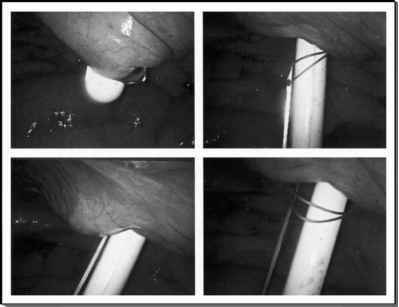 Our experimental data demonstrated the feasibility of retroperitoneal lymphadenectomy using the hydro-jet technology. 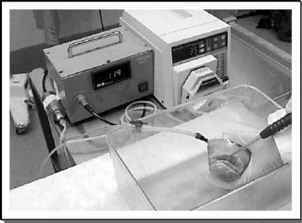 study, three pigs underwent retroperitoneal lymphadenectomy using hydro-jet dissection (20). Animals were sacrificed at the end of the procedure. The procedure was completed in all animals. All lymphatic tissue below the level of renal artery to the bifurcation of the aorta was removed. The pressure range was 300 to 400 psi (21-30 bar) initially. No injury to adjacent great vessels was noted during dissection while the sympathetic nerve fibers in retroperitoneum were preserved. The dissection time was 20 to 30 minutes and amount of normal saline used was less than 200 mL. Our experimental data demonstrated the feasibility of retroperitoneal lym-phadenectomy using the hydro-jet technology. Hydro-jet nerve-sparing retroperitoneal lymphadenectomy permitted tissue selectivity with preservation of vascular structures and sympathetic nerves. The soft tissue and lymphatics were removed with the high-pressure saline stream assisted by blunt dissection. The nerve fibers were grossly resistant to the pressure used and were isolated individually. 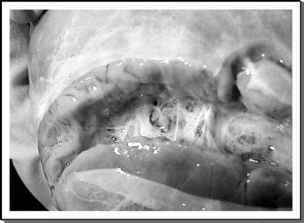 Sympathetic nerve fibers leading to the hypogastric plexus were isolated and preserved.